Why has the Computing Progression Pathways been created? 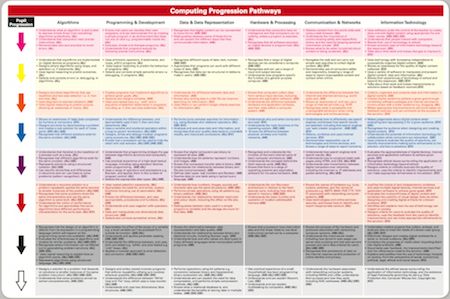 Who is using the Computing Progression Pathways work? How does the Computing Progression Pathways work? Can I use the Computing Progression Pathways to generate an overall level of attainment of my learners? Can Computing Progression Pathways be used to define sub-levels? How do the Computing Progression Pathways support the setting of targets? Can my school use the Computing Progression Pathways to report attainment and progression to learner, parents and guardians? Can the Computing Progression Pathways be customised to meet my curriculum needs? Is the order of the learning statements in a topics (columns) and colours (row) in the Computing Progression Pathways important? Why are there codes inside brackets at the end of each learning statement in the Computing Progression Pathways? Why are there two versions of Progression Pathways? The wording in the Computing Progression Pathways doesn’t seem very learner friendly? How can I use the Computing Progression Pathways to identify the detailed lesson learning outcomes and ‘I can’ statements for learners? Where can I get a list of ‘I can’ statements? Can I use the Computing Progression Pathway to transition data from the previous national curriculum and system of levels? Supporting teachers with interpreting the breath and depth of the end of Key Stage statements in the 2014 National Curriculum Programmes of Study for Computing. Supporting schools in the transition away from ‘levels’ to ‘assessment without levels’. The Computing Progression Pathways has had over 25,000 unique downloads since publication in January 2014 at BETT. It is one highly popular interpretation of the breadth and depth of the Computing curriculum in schools. In addition, many popular commercial and non-commercial educational providers are already mapping their teaching resources to the Computing Progression Pathways to support teachers with integrating them into their curriculums. Each column includes one area from the Programmes of Study and also aligns to the topics found in the CAS’s Computer Science: Curriculum for schools and Department of Education’s Subject knowledge requirements for entry into computer science teacher training documents. The learning statements and defined progression has also been aligned to the progression outlined in the CAS Primary and CAS Secondary guidance to the Programmes of Study documents. The Computing Progression Pathways contains 152 (high level) learning statements (competences) i.e. knowledge and skills. 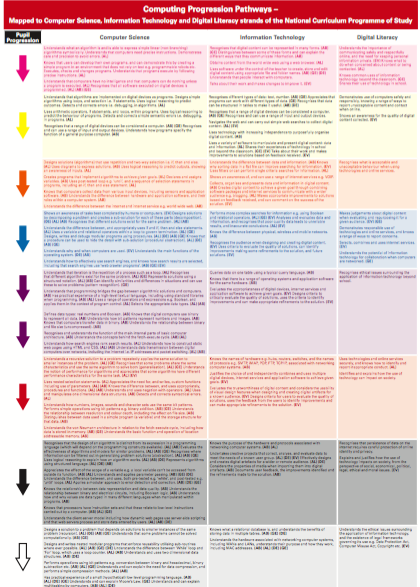 These learning statements are grouped by topics (column) and are broken down into colours (rows). In any one learning journey (scheme of work) a learner may progress in many learning statements from several topics (columns) and colours (row). No - from September 2015 schools will need an alternative to ‘levels’ in place. 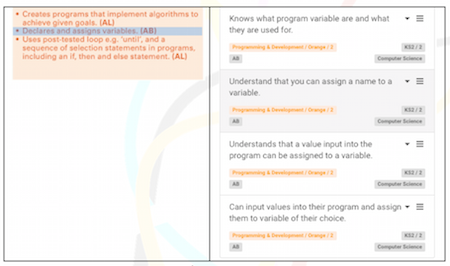 Although, at first glance, it may appear that the Computing Progression Pathways uses ‘levels’ because it groups learning statements into topics (columns) and colours (rows), this is not the case. The grouping of learning statements is to help with understanding the dependencies both vertically and horizontally between learning statements to help ensure steady progression. Although some schools are using the Computing Progression Pathways as a replacement for levels, the authors of the Computing Progression Pathways would strongly advise against aggregating a level (i.e. colour) from the attainment and progression in the different topics (columns). "Although levels were intended to be used to assess pupils against the whole programme of study, the results of almost any assessment were translated into a level or sublevel and used as a measure of overall attainment. This either required aggregating a wide variety of data into a single number, which did not represent pupil performance accurately, or meant that levels were being assigned to individual pieces of work, regardless of how much of the programme of study they covered." From September 2015 Schools will need an alternative to levels and sub-levels in place. Therefore, it is not intended that schools use the order in which the learning statements are presented within topics (columns) colours (rows) or the assigned Bloom’s Taxonomy value, in order to attribute a weighting to the learning statements and use them as attainment ‘levels’ or ‘sub-levels’. Schools could use their understanding of their learners’ competencies (learning statements) from the Computing Progression Pathways to develop a list of what each learner can and can not do, to then set targets for particular competencies (learning statements) and then monitor attainment and progression using formative and summative assessment methods accordingly. 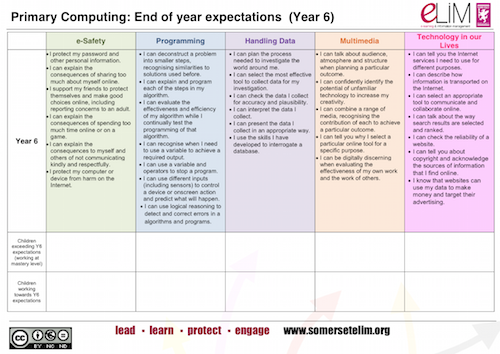 One approach could be to use the Computing Progression Pathways to report attainment and progression to learners, parents and carers by listing the learning statements from the framework that learners can do, can’t do, and are still working towards; then set appropriate and meaningful future focuses for learning (targets). As the Commission for Assessment Without Levels also points out, this could be especially useful for engendering a sense of responsibility in the learners for their own learning, and could result in a more meaningful dialogue between the learner and their teacher. Absolutely – yes! It can, and has been, easily adapted to match school curriculums. In line with the Department for Education guidance, the Computing Progression Pathways can be customised by adding, amending and removing learning statements to reflect the content of your school curriculum. The authors of the Computing Progression Pathways welcome this, because they feel that it is important to share good practice with the Computing education community - both what works and doesn't work. The learning statements (competences) within a given topic (column) colour (row) are not weighted by either the order they are present, nor are they ordered based on Bloom’s Taxonomy. To understand more about the dependencies between learning statements, one approach is to read and perform a mapping process between the CAS Primary and CAS Secondary guidance to the Programmes of Study documents and the Computing Progression Pathways. There are up to 5 codes (AB, DE, AL, EV and GE) after each of the learning statements in the Computing Progression Pathways. These relate to the computational thinking opportunities available to be developed by the class teacher and learners when undertaking classroom activities based on each of the statements. Each of these computational thinking opportunities have been identified by a team of experienced classroom teachers and academics in the CAS Computational Thinking Guidance for Teachers. There are two versions of the Computing Progression Pathways and each serves a different purpose. The learning statements and the colours in both versions of framework are the same. The topics (column) that the learning statements are allocated to are different. The original Progression Pathways has six topic areas and is designed so that the subject of computing can be seen by both teachers and learners as a whole. It helps to show the inter-dependencies between the concepts and the principles, and their applications. The topics (columns) have been aligned to both the CAS Computer Science: Curriculum for schools and Department of Education’s Subject knowledge requirements for entry into computer science teacher training documents. The second version of the Computing Progression Pathways document uses the same learning outcomes as the original version, but divided by the three unofficial strands of computing (Computer Science, Information Technology and Digital Literacy) put forward in the National Curriculum Programmes of Study and The Royal Society report Shut Down or Restart. This version provides teachers with a tool to evaluate their existing curriculums, to identify what is still relevant from their existing ICT (Information Technology and Digital Literacy) curriculum and identify the areas where they need to develop their curriculum further. Both the original version (6 topics) and this new version (3 unofficial strands) of the Computing Progression Pathways are in alignment with the Computing At School’s primary guidance and secondary guidance documents. The wording in the Computing Progression Pathways doesn't seem very learner friendly? The Computing Progression Pathways uses the correct and appropriate vocabulary for the subject of Computing. The Learning Statements are not intended to be used directly with younger learners. Current guidance makes it clear that we should use subject specific technical vocabulary with young learners. Just as we would share the official vocabulary of phonics, such as grapheme, phoneme, digraph and so on; we need to trust that learners in Primary school will understand what ‘algorithms’ are, when explained. To make the Computing Progression Pathways document more ‘learner friendly’, each learning statement has been turned into ‘I Can’ statement. Some examples of this have been shared by teachers via the Resources area in the Computing At School community website. The Computing Progression Pathways contains 152 (high level) learning statements mapped to Bloom’s Taxonomy, covering a highly popular interpretation of the breadth and depth of the subject of Computing. The use of Bloom’s Taxonomy in the wording of the learning statements is designed to provide guidance on the detailed learning outcomes required to complete a given learning statement within a particular topic colour. For example, from discussions with colleagues in the Computing education community the learning statement "Declare and assign variables" could have up to 4 (or more) learning outcomes. ‘I can’ statements are usually used as an assessment tool so that learners can self-assess their skills. They tend to be written in ‘learner speak’ and will be discussed at the beginning and end of lessons. 'I can' statements can also be used when setting targets and providing feedback to learners. Most good commercial and non-commercial learning journeys (schemes of work) will provide ’I can’ statements based on the 2014 National Curriculum end-of-Key Stage expectations and/or the Computing Progression Pathways. In the Somerset’s Support Services for Education, ELIM team Teaching Resource (below), each strand contains a progressive range of ‘I can’ statements. You can easily match these learning statements (and others from other educational providers) to the Computing Progression Pathways. Depending upon your school’s interpretation of the previous ICT National Curriculum and the 2014 Computing Programmes of Study, some of the learning might be still relevant e.g. at Primary the QCA Control units. If there is overlap between your interpretation of the previous ICT Programmes of Study and Computing Programmes of Study then one approach could be to benchmark specific competencies and associated attainment data, between the previous ‘levels’ system with the competencies outlined in the learning statements in the Computing Progression Pathways. However, the likelihood is that much of the data will not be relevant. This approach to mapping of competences between the previous and current curriculum could help your school to demonstrate progression during this period of transition from ‘levels’ to ‘assessment without levels’. If your schools Assessment Policy is in alignment with the latest Department for Education and Ofsted Inspection guidance, then it is suggested that schools evaluate the quality of their ‘levelled’ data to ensure that it is accurate and free from bias and in doing so avoid presenting the data about learners’ attainment and progression in the same way as the old system of 'levels'.